- Taveras impressed during spring training, showing a live arm and big fastball, and he has been very impressive early in the Lowell season, save for his first outing when he struggled with his control and got hit around a bit. 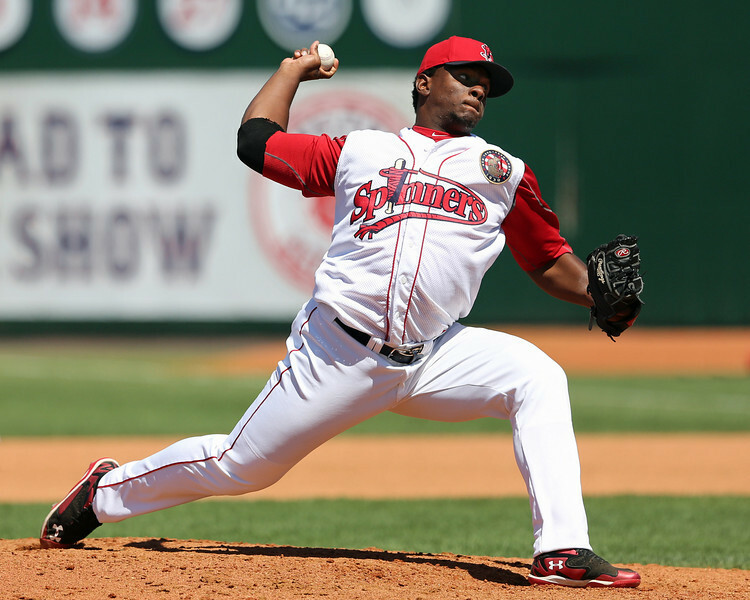 Taveras has quick arm and a complex delivery with a lot of moving parts. He has a little drop and drive in his delivery and collapses his backside before moving forward. At this point he is raw, and more of a thrower than a pitcher. Even so, Taveras has shown plus-plus velocity, sitting 93-95 mph generally topping out at 96 mph in the outings I’ve seen from him. His fastball shows plus life and heavy arm-side run, at times starting over the middle of the plate and ending up well off the outside corner. Taveras slider is his primary out-pitch, showing plus potential, but he hasn’t consistently shown the sharp version of the offering. At its best, the pitch is extremely sharp, working 83-87 mph with tight rotation and late dart. Taveras has also shown a more slurvey version of the pitch in the low-80s. He doesn’t always consistently finish the pitch, however, resulting in it being left up in the zone at times. Taveras has also shown a below-average changeup, but he has rarely used it in game action. His changeup was firm and straight at 84 mph when he did use it, and he lacked confidence in the pitch. Taveras is an intriguing arm out of the bullpen, but it could take some time for him to put it together. - I had the chance to see Garcia twice with Lowell as he continued his rehab from Tommy John surgery and he impressed with his raw stuff. Garcia doesn’t have much projection in his frame and is only average sized, listed at 6 feet, 185 pounds. He throws from a high three-quarters arm slot, but his delivery is stiff with a stab and long arm action behind him. He is quick to the plate from the stretch at approximately 1.2 seconds. In both outings I’ve seen from him this year, his velocity has been impressive, but he has lacked feel for his secondaries. Garcia has a live arm and his fastball has sat 90-94 mph topping out at 95 mph. He struggled with his command, however, which isn’t surprising due to the extended time off he has had. The pitch is pretty straight, but on occasion when he finished his delivery, it showed some arm-side run. In the second outing, Garcia had trouble locating glove side, consistently missing up and away. When he was in the zone, he got hit around as he was leaving the pitch up where it was straight and hittable. He did, however, still show the ability to miss bats with the heater. Garcia’s secondaries consist of a slider and a changeup with the slider showing better thus far. Garcia’s slider worked 79-84 mph with short 10-4 movement and some bite in the higher velocity range, but longer, slurvey movement in the lower range. He flashed a few average ones, but overall the pitch was below-average. Garcia also mixed in a few changeups in the mid-80s. They were firm and straight and he slowed his arm down, thus they looked more like a fastball that he took something off. As Garcia gets more innings under his belt, he is one to watch as he could profile as an intriguing bullpen arm in the future due to a combination of his delivery and inconsistent secondary offerings. 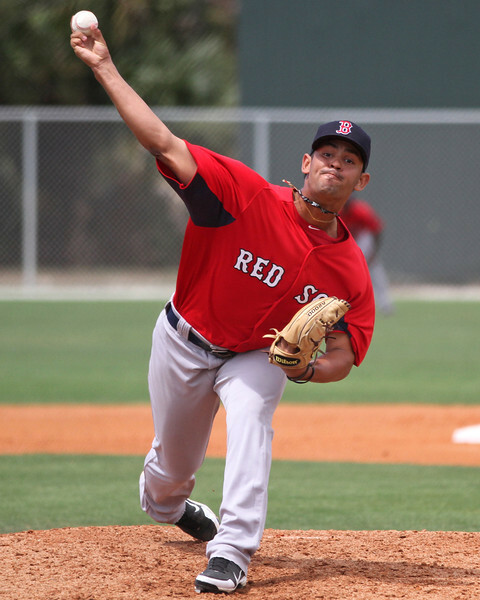 - Like Garcia, Heri Quevedo was also in Lowell on rehab assignment and saw his first action of the season. He really struggled during his three-inning stint. Quevedo has a filled out frame, with limited physical projection. He throws from a three-quarters arm slot and he often lands off balance with a rigid delivery especially in his backside. Quevedo also throws across his body, placing a significant amount of stress on his shoulder. Based on these mechanics alone, Quevedo likely profiles best in a bullpen role. Quevedo’s fastball sat 91-93 mph in the outing, touching 94 mph. The pitch showed some arm-side run, but he struggled with his command, giving up a lot of hard contact. Both his secondaries are rudimentary and need significant refinement. His slider came in at 80-83 mph, but it was inconsistent and he lacks feel for the pitch. On occasion the pitch showed short, horizontal break, lacking tilt, but other times it was loose. Quevedo showed a little more feel for his changeup, which he threw 84-86 mph. He used the pitch sparingly, but it showed some deception and fade in the zone. - During Lowell’s three-game opening homestand, 2013 12th round pick Drehoff was impressive. Drehoff has a projectable frame, listed at 6 feet 4 inches, 195 pounds with room for added strength as he matures. Drehoff throws from a three-quarters arm slot and his delivery is simple and easy. He works quickly and did a good job repeating his delivery in the outing. Though Drehoff doesn’t have a big fastball, he showed advanced feel for his secondary offerings. Drehoff’s fastball sat 87-89 mph in the outing. He did a good job commanding the offering over his five innings of work, but at times he didn’t always finish the pitch resulting in it being elevated. Drehoff also showed off an 85-86 mph cutter with late, short movement in on the hands of right-handed hitters. He also mixed in a changeup and curveball, with his changeup showing the most potential during this look. Drehoff throws the changeup at 79-82 mph with good arm speed and late drop, showing the ability to miss bats with it. His curveball has long, sweeping two-plane break and comes in 75-78 mph. Drehoff has a polished arsenal and if he continues to show command and control like he did in this look, then he should be one of the more successful arms in the Lowell rotation this season. 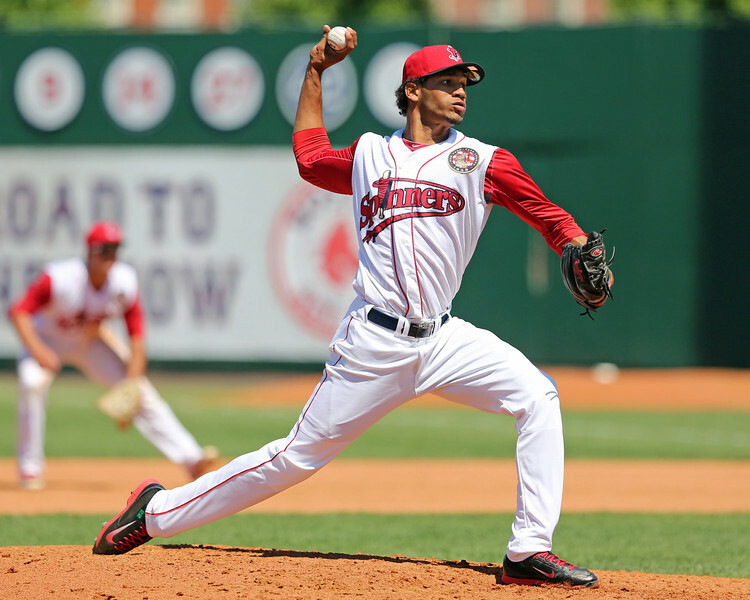 - Garcia is a tall, lanky right-hander who is very raw at this stage in his development. Garcia throws from a high three-quarters arm slot, but is straight up, with stiff mechanics, a long loop behind, and lacking balance in his delivery. He does have a projectable frame with room for physical development. Garcia’s fastball worked 91-93 mph and he touched 94 mph, but he struggled with control during this look. He doesn’t pitch downhill, and is very inconsistent in finishing his delivery. He was able to throw strikes when he took something off his fastball in the 88-90 mph range. Both his secondaries are at the developmental stage, a high-70s slurvey, sweeping breaking ball and a firm mid-80s changeup. Garcia has some arm strength and is still young at only 20 years of age, but it will take a lot of development to establish himself on the prospect radar. - Once a well-regarded international prospect as a catcher, Perez received a $712,500 bonus back in 2008, but struggled at the plate before converting to pitching in 2013. Perez isn’t overly physical, only averaged size, but with a developed lower half. His delivery is controlled, but his arm is slow. In two outings scouted this year, Perez has shown the ability to throw strikes with his high-80s fastball, topping out at 91 mph, but the pitch doesn’t miss bats. His secondaries include a straight changeup at 82-84 mph and a loopy, 12-6 curveball in the low-70s. Perez could find some success at the NY-Penn League level with his ability to throw strikes and effectively mix his secondaries, but his margin for error is slim due to below-average stuff.